Update: Watch the GodotCon Livestream here. 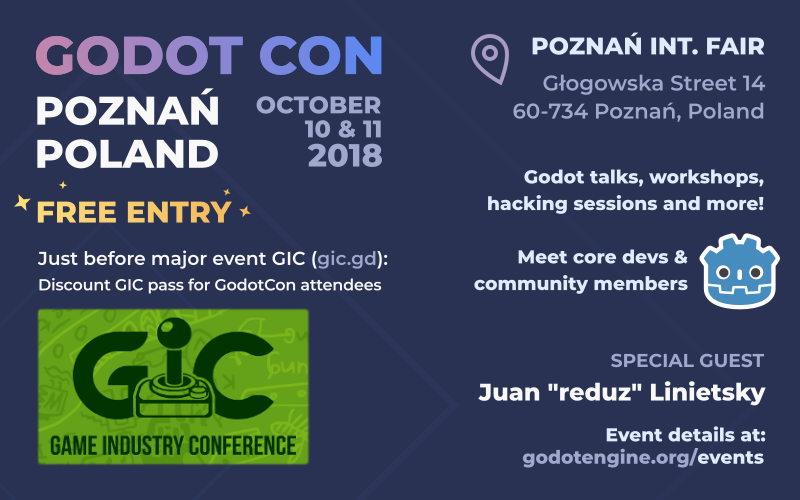 As announced a few weeks back, we're organizing a Godot Convention (GodotCon) in Poznań, Poland, on 10 & 11 October 2018. The organizers of the Game Industry Conference (which is also in Poznań just after GodotCon) are letting us use their great venue, and it will be a great opportunity to get together with Godot users and core developers (our lead dev Juan Linietsky is coming from Argentina). If by any chance you're close to Poznań and free next week, you can still register! It's free, you just have to fill this form to let us know. See the events page for more details. The schedule is not 100% final yet, but here's an overview of the talks/workshops that we planned so far, and some information on the speakers. The order shown below is only indicative, the exact time for each activity will be given Wednesday morning. As mentioned on the events page, we plan two different focuses for the first and second day. The first day will focus more on engine contributions and technical discussions around the roadmap and future features, while the second day will be more general purpose with different talks and workshop to share game-making knowledge. Everyone is invited to attend both days though, we'll have activities proposed to match all interests. Godot relies on its community to evolve, and there are many ways for everyone to contribute depending on their skills and interests. Godot's code base is big, but well organized. Gilles will show how to dive in the editor/ folder to make changes to the editor without impacting the core engine. Bring your computer and work on fixing engine issues or writing documentation under the guidance of core Godot devs. Prerequisites: Laptop with Git, and for code contributions a C++ compiler installed. The next release comes with many new networking and multiplayer features, both high level APIs and support of protocols like WebSocket, WebRTC and UPNP. A presentation/discussion about the approach to the code and assets structure, and how it works for your team depending on the composition and experience of said team. 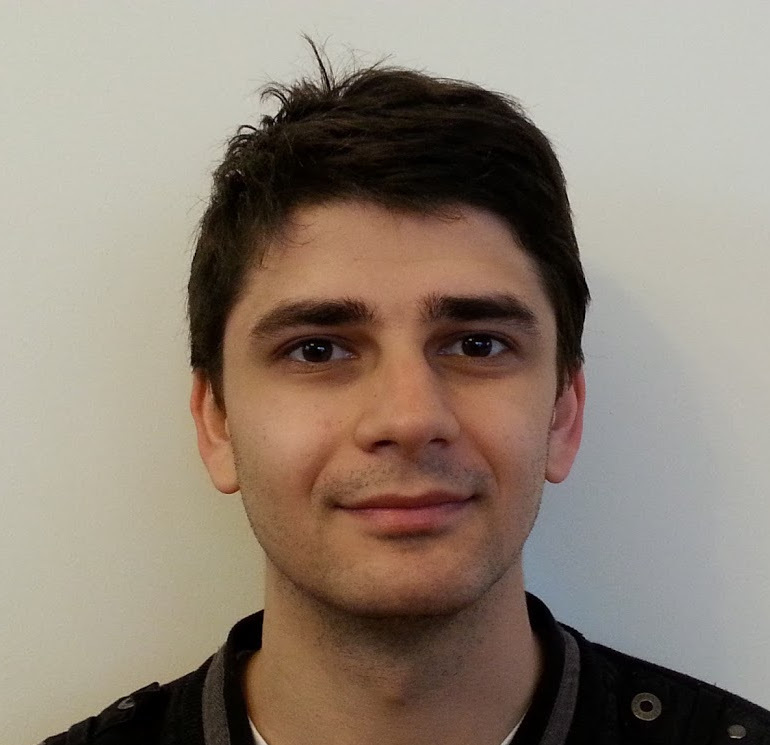 Leszek will demo the development of a 2D game with audience interaction. Several options will be available based on attendees' interests: platformer shooter, space shooter with enemy AI, drift racing game, and pong with a twist - destructive environment. Juan will show us how the exciting new TPS demo is set up, with insights in how to import assets, set up 3D scenes and configure the materials and environment for such a visual output. A quick set of patterns, tricks and rules that I like to keep in mind when I'm developing a game in Godot Engine. Godot is a powerful multipurpose engine that can be used for pushing the boundaries of medical simulation. In this presentation we will explore non-conventional use of the engine, software practices that emerged during development and thoughts about Godot itself. Overview of simple tools and tricks that will get your project released, handpicked from agile development methodology. Simple and overhead free. Jagiellonian University is deploying Godot as main teaching software for Geometry and Simulation. 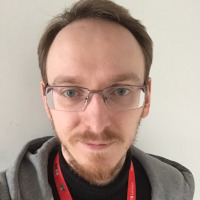 Leszek will present their project and how the Godot community can benefit from it. My story of learning shaders the hard way - by doing an awesome grass shader! Basic way to get a normal mapped 2D sprites from Blender to Godot, and a few fun things you can do with them in Godot. Prerequisites: Laptop with Godot 3.x and Blender 2.79c installed. 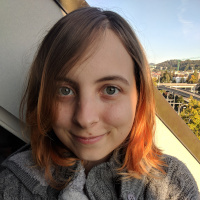 Ilaria Cislaghi is a game designer working for simedis AG, a company specialised in virtual reality medical simulation. In her free time, she enjoys developing games about Antarctica with Godot. 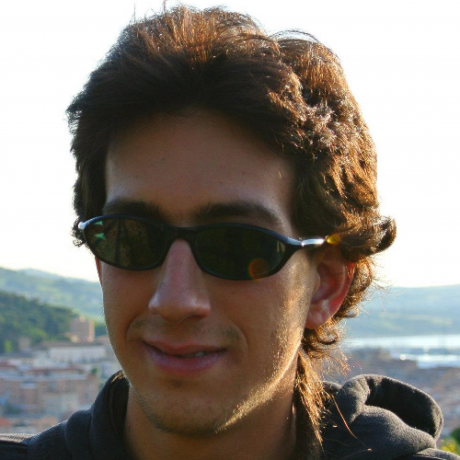 Fabio Alessandrelli is a core Godot developer and maintainer of the networking stack of the engine, among other contributions. As an indie dev, he also published Aequitas Orbis in early access, a multiplayer 2D space game using Godot 2.1. 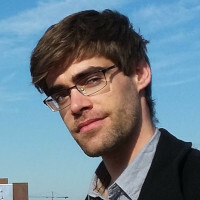 Gilles Roudière is one of Godot's core developers and focuses lately on the engine's usability, with many changes to the editor like an enhanced FileSystem dock, a better workflow in the 2D CanvasItem editor and a new axis handling system for gamepads. 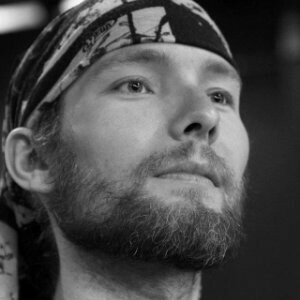 Jakub Grzesik is the programmer half of Polish studio Kivano Software, who brought us the Godot game Marble Machine and is now getting close to releasing RivenTails: Defense. He's also a contributor to Godot's bug triage team. 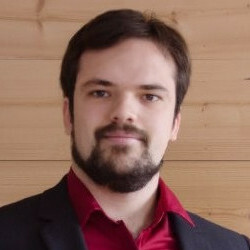 Krzysztof Jankowski is the prolific coder of FOSS-focused Polish studio P1X, and worked on projects such as Tanks of Freedom, Piradice and BitWars. Mariusz Chwalba describes himself as a programmer by trade, gamer by hobby, game developer for fun. 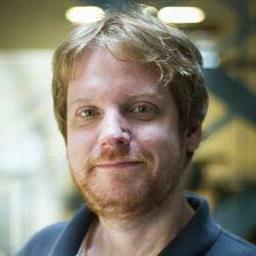 He loves sci-fi and fantasy - both movies, books and games - and works on ΔV - Rings of Saturn with Godot 3.1. 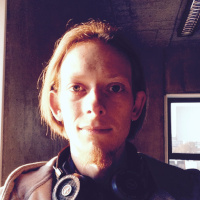 Wojciech Chojnacki is a professional backend programmer, also streaming and gamedev enthusiast, enjoying making games as much as playing them. Part of the P1X team, working on small, open-source projects.